Within my first thirty minutes of playing Black Knight Sword, I encountered a menu option called "cat head grass," a giant mother eye that eats hearts, and severed skulls in a microwave oven that serve as health power-ups. Yep, this is definitely a Grasshopper Manufacture and Digital Reality joint. Black Knight Sword features a minimalistic story, which is really what you make of it, all the way up to the game's unfulfilling ending. 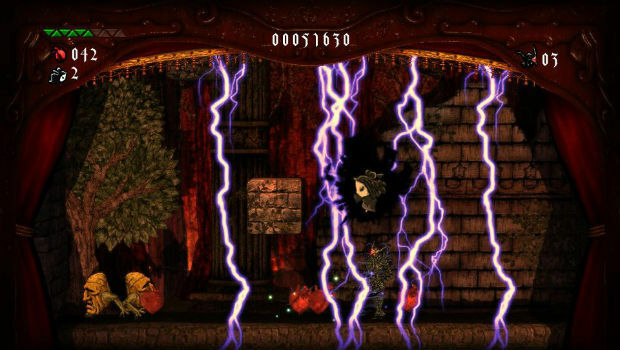 Set behind the backdrop of a theater play, it combines this premise with platforming mechanics resembling linear old-school Castlevania titles. There are giant fire-breathing chickens, pig-motorcycle hybrid creatures, and a lot more I don't want to spoil here. Still, despite the addition of quite a few obvious oddities, it doesn't really feel unique. Everything on offer here, whether it's level design or gameplay mechanics, you've seen before. I don't know whether or not Grasshopper is losing that "Oh my God, it's Grasshopper -- I have to buy it on principle" effect, or if this is an isolated incident, but going in with lowered expectations for Black Knight Sword is probably a good idea. The art style, while not wholly original, does look pretty neat however, especially on-screen. The best way I can probably describe it is as the illegitimate lovechild of LittleBigPlanet, Rock of Ages, and Monty Python (that's a compliment, mind you!). The aptly named mysterious hero can attack, evade, double jump, and use magic, as well as utilize a charge attack, and a few other typical staples of the genre. Everything pretty much works as advertised, save one move: the evade mechanic, which is enacted by pressing down and jump. This counter-intuitive dodge method can be a problem, as you need this ability fairly often in higher difficulties, and the controls are so finicky that it's hard to perform consistently. I don't see why it couldn't have corresponded to a button like Symphony of the Night's back-dash, especially since so many buttons go entirely unused. Once you actually get a handle on the jumping physics, you'll have to do quite a bit of precision platforming. Truth be told, I didn't really think any of the platforming sequences were that difficult until one small section on the game's final stage. That's either a good or a bad thing, depending on what you want from the game, but I know a lot of people will most likely have trouble acclimating themselves to the sometimes floaty jumping system. Also, when the Black Knight attacks, he sort of thrusts, kind of like Sir Arthur in Ghosts'n Goblins, which may take some getting used to as well. But the controls aren't the only thing you may be at odds with. Since you're in a "play," a giant stage obscures a lot of the screen. You can use the right analog stick to move the camera around and view your surroundings, but this might not be enough to work around the annoyance. For me, it was fine. The ability to manipulate the camera while running and jumping was a godsend (and should be in a lot more games), but it still would have been nice to turn off the stage in subsequent playthroughs. 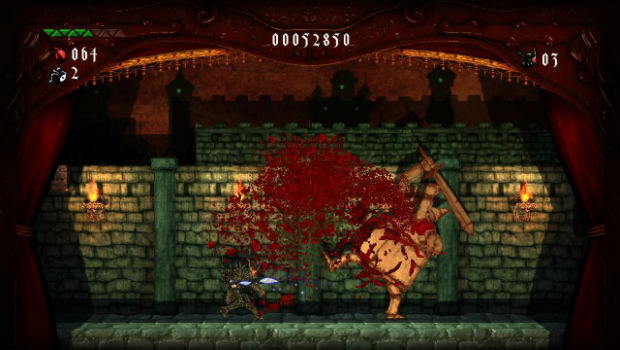 Nearly every enemy drops hearts, which can be used in the game's shop. It gives an incentive to fight enemies, but odds are unless you're playing on the hard difficulty, you won't go out of your way to get them. The shop is pretty barebones, and isn't really needed outside of the crucial maximum health bonuses. It would have been neat to see the shop expanded, but sadly, like a lot of the rest of the game, it feels way too familiar and trite. Another strange design choice is the fact that there's no autosave function. If you want the game to remember your progress, you have to manually save -- and when you do, there's no notification that you were successful. I can imagine quite a few people glossing over this (as it's only briefly mentioned in the tutorial), and getting pissed off at the loss of progress. One major thing to factor into Black Knight Sword is the difficulty level, which harkens back to the days of yore, when 2D platformers were actually challenging. While it will probably give you a run for your money more than most contemporary platformers, you have to play it on hard to really get the feel of a true challenge. Provided you do that, you're in for a treat. For a $10 platformer, there's a decent amount of content to hold you through after you finish your first playthrough. There are easy, normal, and hard difficulty levels, as well as a number of collectibles, an Arcade mode, and a few Challenge missions. It took me about three hours to beat the game's five total levels, including the final "Dr. Wily-esque" re-boss stage. At the end of the day, there's not much to Black Knight Sword. 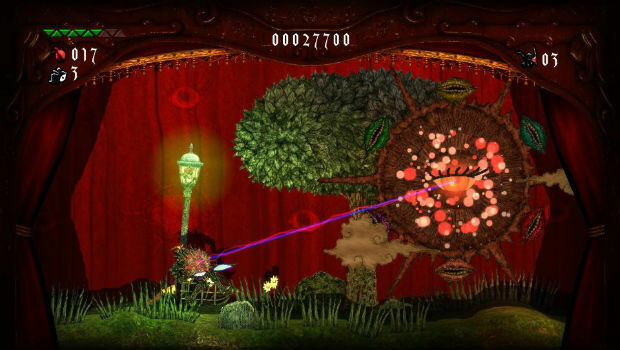 It's a platformer, it's kind of weird, and it doesn't really do anything new. When I was finally finished with the game's controller-flingingly hard final boss, I kind of looked at the screen and went "Huh, that was nice." I guess I'm a little numb to Grasshopper's tendency to exploit the world of weird, but either way, I did enjoy my brief time on stage, and fans of old-school platformers should too.